And to think that Providence Sister Therese Whitsett once thought it was her idea to enter the Sisters of Providence, go to Bolivia and Peru, spend a summer ministering at a migrant farm camp, work at an Indian reservation in North Dakota, become certified as an English as a New Language teacher, and now use her skills as an ENL staff member at an Indianapolis parish school in a high-crime area. “At one time, I wanted to be a Maryknoll missionary, then I didn’t want to be a sister at all. Then I thought I’d like to be a teacher. I knew I would like to serve the Church,” said Sister Therese. “In those days, in the 1950s, there weren’t many options for women. You were a nurse, you were a mother or you were a nun. Sister Therese, who is 64, grew up in St. Anthony Parish on Indianapolis’ west side in a devoted Catholic family with nine children. “I had Sisters of Providence for teachers all through my elementary school years,” said Sister Therese. “I liked watching what the sisters were doing. They seemed like they were a happy group of people. I liked how they taught me. The desire to be a missionary appealed to Sister Therese. “I used to read books about the missionaries. It was something out of the ordinary, giving your life to go far away. I would have been like an adventure to do something heroic,” she said. She entered the Sisters of Providence in 1962. In 1969, she went to Bolivia to learn Spanish and later spent 18 months ministering at a Jesuit elementary school in Peru. Sister Therese returned to the United States for a transition ministry in an elementary school then spent a summer ministering at a migrant farm camp in southeastern Indiana in Sunman. Providence Sister Peggy Nau called and asked her to join the staff at a Native American reservation in North Dakota. “Every mission I have been on has changed me. You do not have to leave the United States to be a missionary,” Sister Therese noted. She used her Spanish skills again when she returned to the Chicago area in a parish community heavily populated by Hispanic and Puerto Rican families. 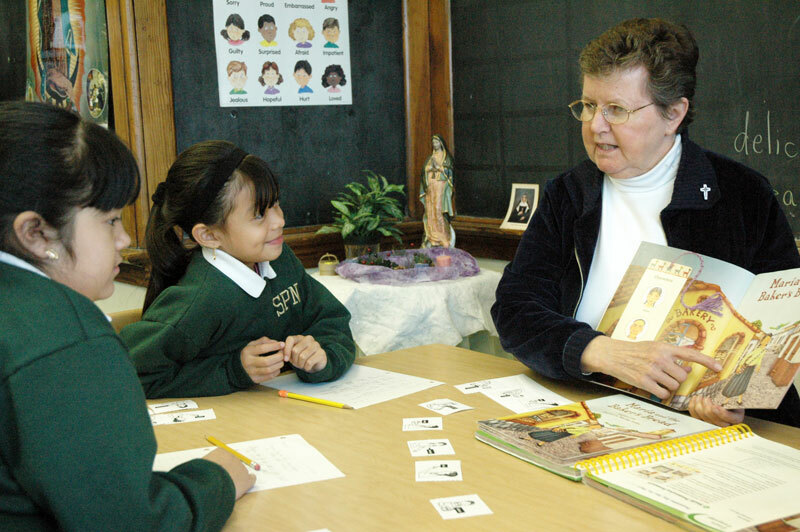 After a sabbatical at the University of Notre Dame and an interim teaching ministry, she joined Providence Sister Marikay Duffy at the Hispanic Education Center in Indianapolis, which has since merged into La Plaza, a centralized service agency for Hispanics in Indianapolis. She learned about an opening for an ENL teacher at St. Philip Neri School in Indianapolis. “[The] Sisters of Providence began teaching at St. Philip’s in 1910, so it is a real privilege to serve at this school,” she added. “It’s my dream ministry,” Sister Therese said. “Every day is a challenge. I have a chance to be with every grade level in the school and help students who are learning English as a new language. Working at the migrant camp was the awakening. “I know that I have heard God’s call. When I was invited to come to the migrant camp, it touched me,” Sister Therese said. “Life is a wonderful blessing. I would never have had these experiences otherwise. Being with these other cultures has really enriched my life.